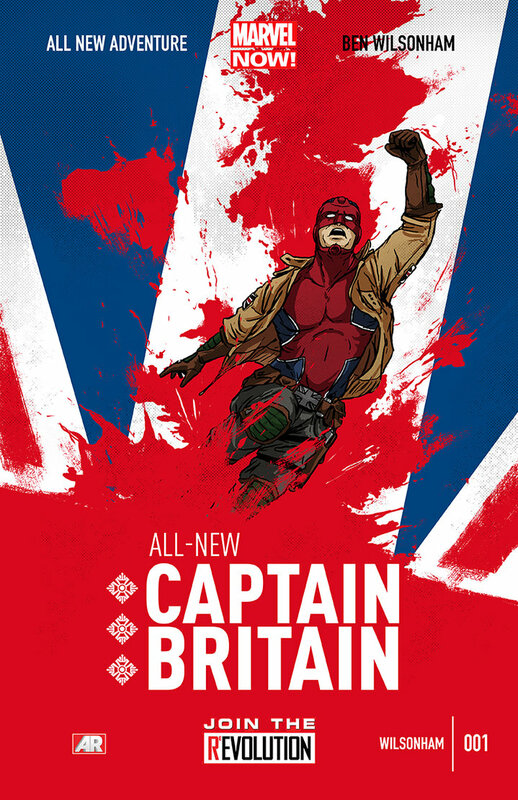 January | 2015 | The Captain Britain fans' page and blog. As the Avengers event Time Runs Out becomes one comic closer to Secret Wars, you can read in New Avengers 29 today a clue as to what might have happened to Captain Britain and the Captain Britain Corps, and it’s an interesting one. Please be aware this article includes spoilers for this week’s New Avengers 29, if you haven’t read the issue yet then do not carry on reading after the picture. 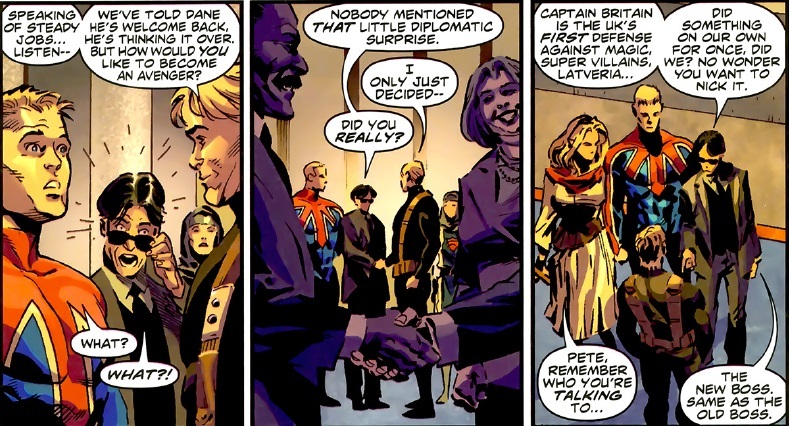 The plot has Mr Fantastic explaining how the Illuminati are trying to prevent the destruction of the Multiverse and how every attempt failed including ” A Multiversal one,” and in just one panel Hickman in New Avengers 29 lets out a clue as to just what fate befell Captain Britain and the Captain Britain Corps. So the possible destruction of the Captain Britain corps as shown on this future Time Runs Out cover below isn’t due to Captain Britain fighting them as I thought, but instead seems to have been a selfless sacrifice to save the Multiverse. Now I’m not sure who the fight is against but the New Avengers panel is an interesting clue/pointer as to the fate of the Captain Britain Corps, and to me I’m glad if they have been destroyed that at least they went out fighting the good fight rather than just being dismissed with a stroke of a pen. Of course Secret Wars is coming and nothing in the current Marvel Universe should be looked upon as being permanent; so the Corps could just as easily be written back into continuity as they were written out. What do you think of the possible fate of the Captain Britain Corps? Can you shed any light on their foes? Let me know your theories in the comments below. You can keep up to date with all the Captain Britain news and views fit to print by liking The Captain Britain Blog on Facebook, or on Pinterest, or subscribe to this blog by entering your email in the link top right. Already following the site on Facebook ? Well you can still help by liking and sharing the blogs posts, thanks in advance. What Captain Britain comics could we expect after Secret Wars? With the exciting news breaking last week that Captain Britain will appear in the Marvel event Secret Wars mine and many more of his fan’s thoughts are now concentrated on three things. First: Will Captain Britain survive Secret Wars? Second: If he does survive what state will he and his supporting cast be in? Third: After Secret Wars will we see a new Captain Britain comic, and if so what form will it take? Today I’m going to speculate on the third of the above thoughts and list seven comic ideas and one actual announced title that should feature Captain Britain, and grace the shelves of any comic book store post Secret Wars. Please remember if I kid I do so out of love. 1. All New Avengers: This title is one hundred percent set to launch after Secret Wars the only missing information being the cast, now Captain Britain is actually an Avenger so it would be great to see him on the roster here. Of course just being an Avenger is no guarantee you will end up on the team, but it would be great to see Cap in one of Marvel’s premier titles even if he wasn’t in every issue. 2. All New International Avengers: From now on the title ideas are purely the results of my speculation, but wouldn’t it be great if Marvel launched an international Avengers team and wouldn’t it be even better if Captain Britain was the leader. I can see this title being similar to DC’s Justice League International or Justice League Europe with a rota of non USA affiliated heroes joining together to fight evil. 3. All New Secret Avengers: While Captain Britain might be too well-known to take part in espionage work his alter ego Brian Braddock might be well placed to serve. He could be the team’s scientific advisor/mission planner directing the operations from the Secret Avengers secret lair, a sort of male counterpart to DC’s Amanda Waller, or perhaps not. 4. 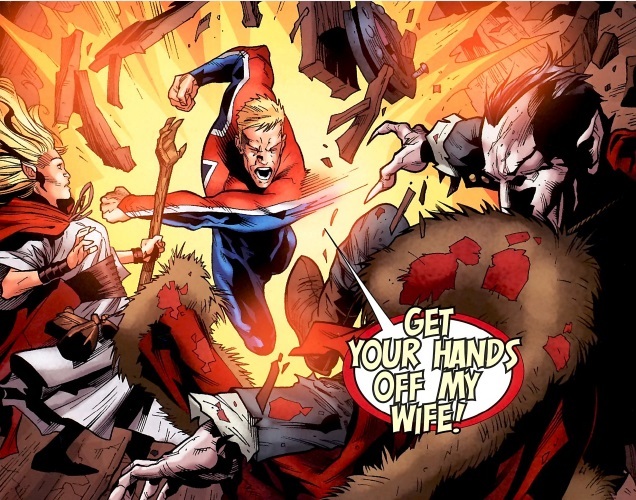 All New Captain Britain: If Cap does get a new title this is the odds on favorite, however I don’t want to see just him in action as this title lends itself to the appearance of his wife Meggan as well. Could they be the new Sapphire and Steel or would their adventures be firmly grounded in traditional superhero territory? Why not a bit of both. So far we have seen some pretty safe bets as to how Captain Britain might appear in a comic post Secret Wars, the next four are bit more “odd” but to me all are workable ideas. Read on and see what you think. 5. The Braddock/Captain Britain Academy: Similar in tone to Lee and Kirby’s X-Men or Wolverine and the X-Men this title would see Cap and Meggan as head master and mistress of a training school for new superheroes, think Hogwarts but with capes not brooms. Old friends such as Dai Thomas or Pete Wisdom might join them as tutors, and perhaps reformed villains such as Hurricane or Joshua Stragg might also make an appearance. 6. Captain Britain Squared: Secret Wars is bringing together the traditional Marvel universe along with all of the heroes from its Ultimate counterpart. To fully take advantage of this why not a new Cap comic where our Cap teams up with his Ultimate counterpart – Jamie Braddock – in a sort of misunderstood cop/buddy movie type way. OK Ultimate Cap is a little on the grim side, but I’m sure a few days or even hours in the company of our Cap would bring a smile to his grizzled face. 7. Captain Britain and the Captain Britain Corps: Providing the Corps survive Secret Wars they might be in such a state that Roma calls on Cap and Meggan to help reorganize them. Think a clash of old school ideas from Roma set off against Cap and Meggan’s new school of superhero thinking, oh and Spider-UK if he’s still alive will be a team fixture. 8. Who you gonna call…the Braddocks! : Imagine a team dedicated solely to solving weird spooky superhero crimes – a sort of cross between Ghostbusters and Scooby-Doo – then you have the idea behind this comic. Brian, Meggan, his brother Jamie and sister Betsy investigate supernatural shenanigans guided from their base at Braddock Manor by the super computer Mastermind. Oh and Widget will not be required to fill any sort of Scrappy-Doo role at all, ever, period. So there you have one definite and seven speculative ideas for Captain Britain comic book appearances post Secret Wars, I’m routing for Who you gonna call, but it’s more than likely we will see Cap in Avengers or his own solo title – providing he lives. If you have any ideas on how Marvel should market Captain Britain after Secret Wars then let me know in the comments below. You can keep up to date with all the Captain Britain reviews, news and views fit to print by liking The Captain Britain Blog on Facebook, or on Pinterest, or subscribe to this blog by entering your email in the link top right. 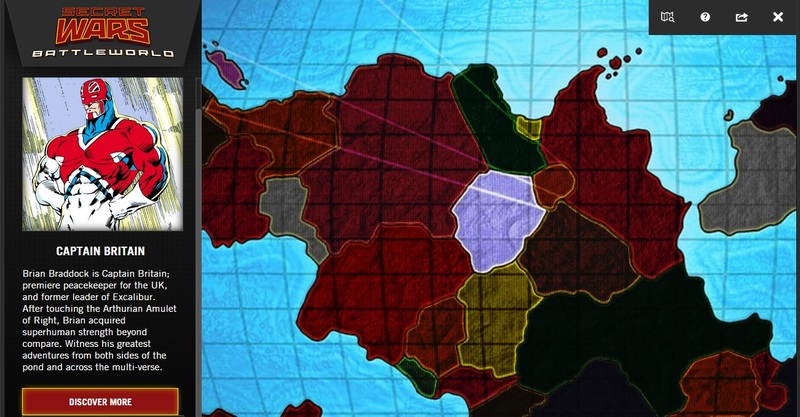 Marvel has recently released its interactive Battleworld map highlighting the many worlds its major event Secret Wars will cover – curious then please click here. Please note you might not be able to see the map if you are browsing on a phone. The map reveals the involvement of Captain Britain or the Captain Britain Corps in the event, as if you click on the area named Higher Avalon Captain Britain appears. Have a look below – click for a bigger picture. Even more revealing is if you click to discover more Ultimate Captain Britain gets a mention, now Marvel have stated Secret Wars will merge the Marvel Universe with the Ultimate one, so will we see two Captain Britains? 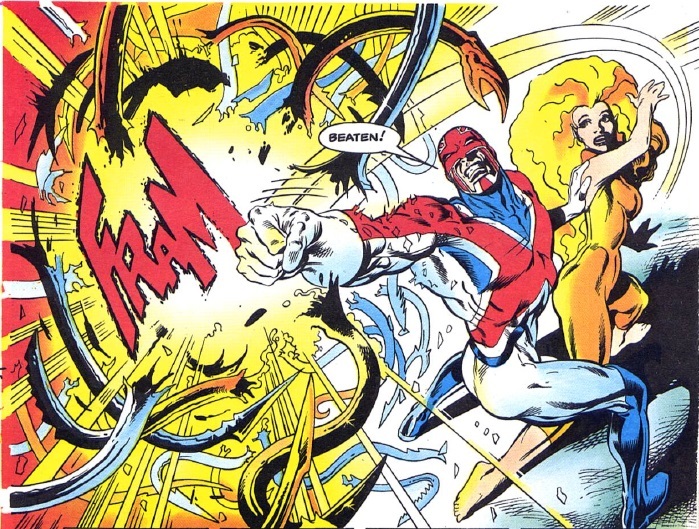 Two Caps could lead to some problems as the Ultimate Captain Britain is Brian Braddock’s brother Jamie who in the regular Marvel Universe is quite insane. Also Marvel are using a picture of Cap which doesn’t match his current appearance in Avengers Time Runs Out. 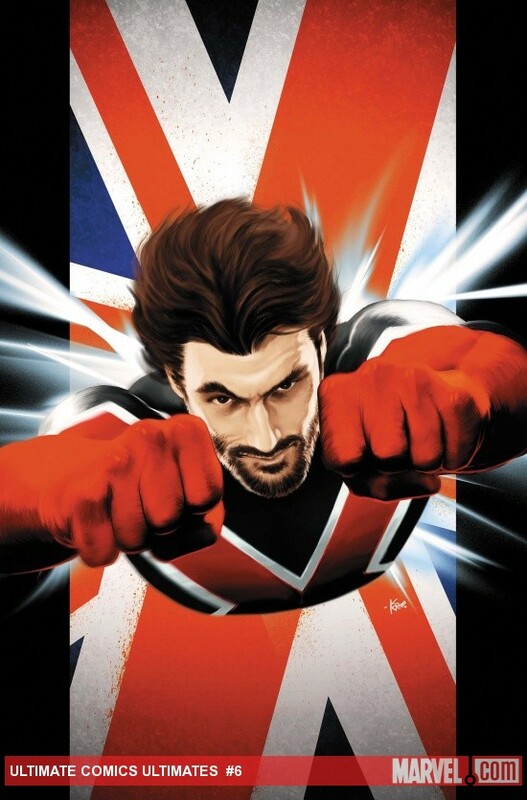 So will Captain Britain get his eye back and have a shave for Secret Wars, who knows? If more Captain Britain Secret Wars news breaks we will report it further. You can keep up to date with all the Captain Britain reviews, news and views fit to print by liking The Captain Britain Blog on Facebook, or on Pinterest, or subscribe to this blog by entering your email in the link top right. The complete Captain Britain comic guide. Issue 2: From the Holocaust a Hero. Welcome to part two of the Captain Britain Blog’s guide to the very first series of Cap comics from the Seventies. Full details of how the review system works can be found here, then please enjoy…. Captain Britain issue 2. Published October 20th 1976. 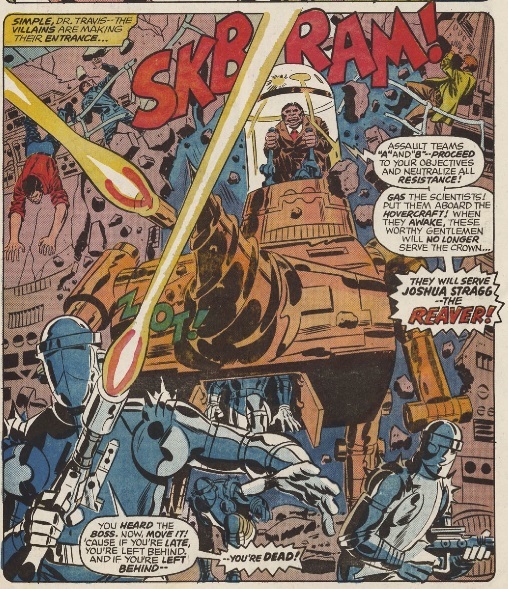 Artists: Fred Kida and Herb Trimpe. You have been watching:- No new faces this week. 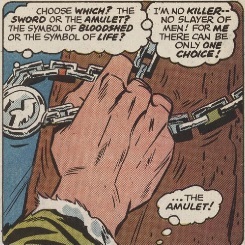 The story so far:- Forced to make a choice between being the bearer of a mystical amulet or sword Brian Braddock quickly chooses the former as the villainous Joshua Stragg chooses the latter. Brian is transformed into Captain Britain whereas Stragg becomes an evil-looking knight in armour. Stragg’s minions attempt to tackle Captain Britain but are easily beaten as our new hero then moves to face off with the Reaver. After a tense battle Cap triumphs and his mysterious benefactor -Roma – tells him he has passed the test and can now fulfil his destiny as a champion of good. Captain Britain agrees and so a legend is born. Continuity:- Though it debuted in issue 1 it’s only in this issue that Cap’s quarterstaff is named, and its power to extend and become by doing so an extension of his heroic abilities is better demonstrated. It is also noted Captain Britain carries this staff on his back. Captain Britain describes his new super powers as making him bigger,faster and stronger, he feels he is literally bursting with power. We see Brian Braddock change into Captain Britain when he touches his amulet which was to become the common way he adopted his secret identity, or returned to his civilian alias. Stragg meets his demise in this issue and is never seen again in Captain Britain or the rest of the Marvel Universe. The comic is labelled as being in colour but to cut costs Marvel printed the last page in black and white and covered it up by saying it’s a coloring page. Well said old chap:- I love how even as he makes a life changing choice Brian still has time to nicely philosophize on his actions. 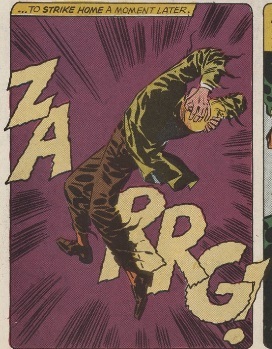 Stand out art:- Captain Britain’s first transformation is shown in this great kinetic panel, with the beautiful ZARRG sound effect perfectly illustrating the other worldly change. Final thoughts:- After last weeks interesting start Captain Britain’s origin heads into standard super hero territory as newly powered he confronts and defeats a super villain. This doesn’t mean to say the tale’s not any good as each panel and page is packed with action and detail, and what’s interesting about the showdown is that Cap uses his fists and his head to defeat the Reaver, who sadly is never seen again. 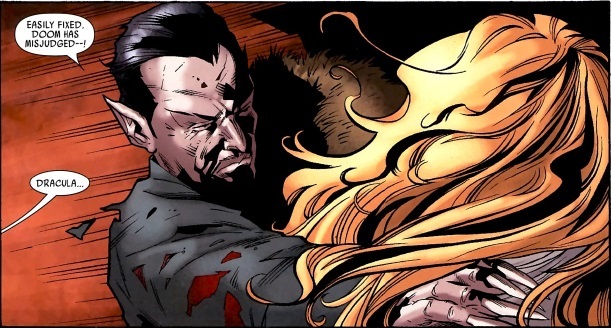 Whilst the Reaver might be seen as a very two-dimensional baddie; this I feel was only down to the lack of space in the strip, fleshed out and returned from the dead for revenge we might have seen him in a new light. 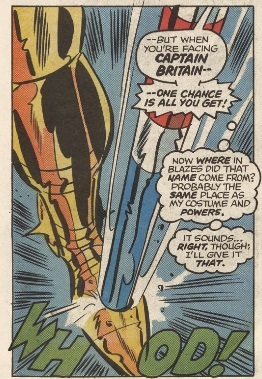 I also feel Captain Britain’s quarterstaff needs some scrutiny, we know Cap has super strength so why he needs a “super stick” to aid him is not really explained, unless it’s just because he needs a foil to Stragg’s sword. To me the staff is inspired by the legend of Robin Hood and while it’s interesting and makes Cap stand out among the super hero crowd just how useful it actually is isn’t really demonstrated in this issue. However keep your eye on the continuity box in forthcoming reviews where I will show you how suddenly the quarterstaff came into its own and had as nearly as many uses as a swiss army knife. 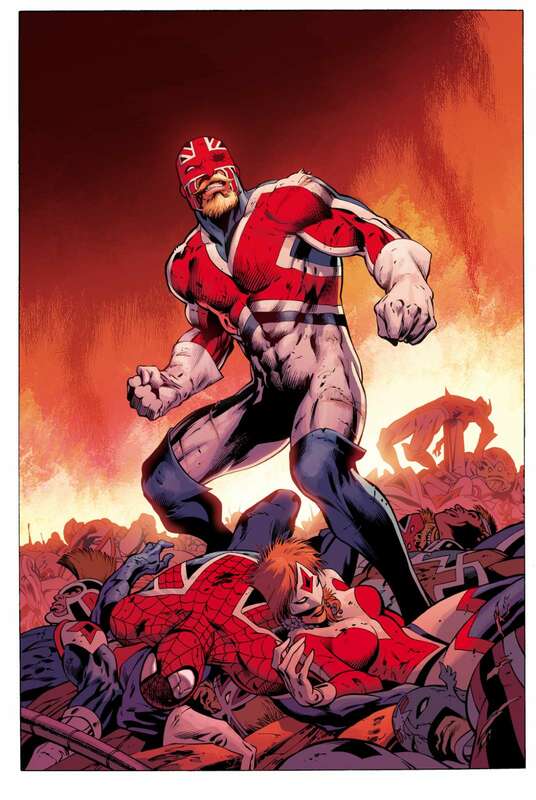 All said Captain Britain’s origin is fun, fast and full of UK flavor, you are left feeling Britain has a hero comparable to the over the pond super types. However my thoughts on finishing the story was just where would Cap go next? Would the Britain of his title be lip service only or would the comic continue to be about a UK hero? I’m pleased to say I was pleasantly surprised but that’s for future final thoughts. You can read my review of Captain Britain issue one by clicking here. You can read my review of Captain Britain issue three by clicking here. Forget Star Wars sometimes you just want to see Captain Britain punch Dracula in the face. With this weeks Avengers Time Runs Out issue being 100% Captain Britain free, and everyone discussing the new Star Wars comic I thought I might take a moment to reflect on just how great Cap is. So from Paul Cornell’s Captain Britain and MI13 issue 15, brilliantly illustrated by Leonard Kirk comes this great two panel sequence of Captain Britain punching Dracula in the face. Then Kablammy straight to Dracula’s kisser. That’s all for now I need to get back to editing the next review for my new feature, see you soon. Oh and for the record I quite enjoyed Marvel’s new Star Wars number one, Jason Aaron delivers a great story and John Cassady illustrates it beautifully. 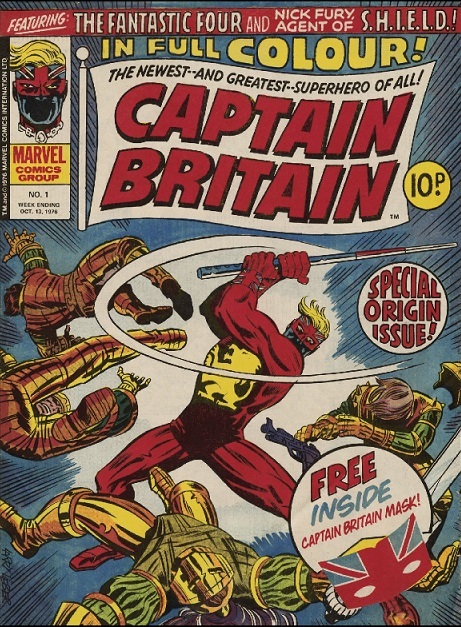 Welcome to the start of a trial of a new feature for 2015 on the Captain Britain Blog, a guide/review to the first forty issues of the Seventies Captain Britain weekly comic. Each week I hope to bring you my thoughts on the early adventures of Captain Britain in the form of an examination of his early escapades issue by issue, for more details and how the reviews will work click here. Once your ready let’s start with…. Captain Britain issue 1. Published October 13th 1976. Artists:Herb Trimpe and Fred Kida. You have been watching:- First appearances of: Brian Braddock/Captain Britain, Joshua Stragg/The Reaver, Merlin and his daughter Roma – both not named. The story so far:- Assistant physicist Brian Braddock is working at the Darkmoor Nuclear complex when super villain Joshua Stragg attacks the plant with the evil plan of capturing all the scientists there to work on his dastardly schemes. Brian attempts to escape on a motorbike to warn the police, but blinded by Stragg’s hovercraft he crashes. On wakening Brian is confronted by Merlin and Roma who tell him he must choose between an amulet and a sword, which could mean life or death for him and the world. Continuity:- A lot of the staples of Captain Britain continuity are introduced here foremost being his supernatural guardians and other world meddlers Merlin and his daughter Roma who will plague Cap throughout his early years. The choice of the sword and staff to a UK hero in waiting will reappear in the Avengers volume 3 issue 77 from 2004, when Lionheart debuts. Captain Britain works in a Nuclear Plant and attends university so we can presume he is highly intelligent, perhaps he’s not at Tony Stark or Reed Richards levels but it seems he has a brain to be reckoned with. This issue also contains one of the very few references to Brian Braddock’s smoking habit, as we see him puffing on a pipe in one panel. 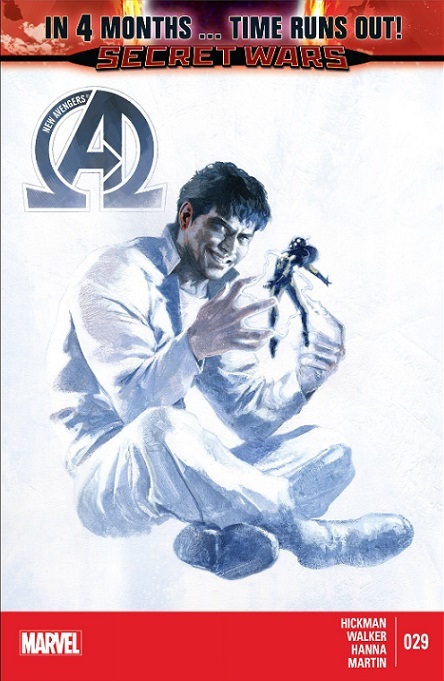 Although the cover boasts this is a special origin issue, the actual story inside is untitled. Well said old chap: Check out the snappy dialogue from Cap as he decides on his new name. Stand out panel: What’s not to like about the Reaver’s dramatic entrance announced with a mighty SKBRAM! Final thoughts:- All super heroes have to start somewhere and in today’s comic book world of over extended story arcs and convoluted origin stories Captain Britain’s debut shines for its brevity. Telling in seven pages what today might take seven issues Cap bursts into life in a story that has it all: evil villains, near death origins, supernatural interference and more. Certainly the comic presents a quirky view of the UK from a US perspective but Trimpe and Claremont were no strangers to England, and in no way do they present to twee an image that might grate or fall into parody. ” With indescribable pride we have presented for the first time anywhere Britain’s greatest super hero. Defender of the weak and oppressed, destroyer of evil and injustice, the mightiest most mysterious man on earth, Captain Britain. 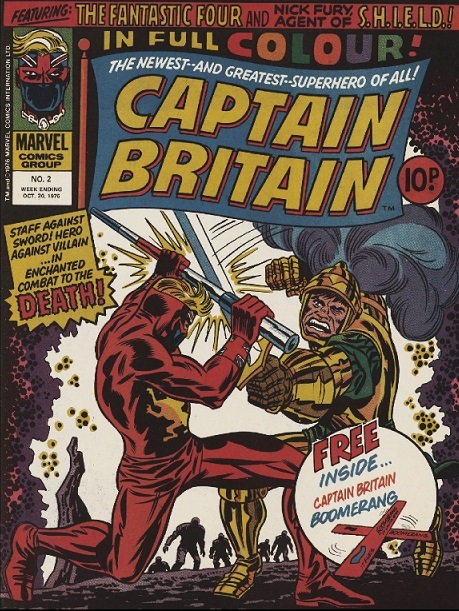 Why not dig out your copy of Captain Britian issue one and let me know your thoughts on Cap’s debut in the comments box. If you have any constructive ideas to improve the review format I would also welcome your comments. Click here to read my review of issue 2. The 5 Captain Britain New Year’s resolutions Marvel must make. 2014 was a good year for Captain Britain, as he was thrust back into the comics limelight due to his intriguing appearance in the current Avengers event Time Runs Out. But what does 2015 hold in store for Cap? Well wonder no longer, as I’m here to help Marvel make 2015 the year of Captain Britain with some handy new year’s resolutions, that if Marvel make them will mean 2015 is Cap’s best year yet. 2014 proved people like reading comics with Captain Britain in so surely it’s time Marvel realised he needs his own series or a team book – Excalibur reunion anyone? Whatever the format of the book and whether it’s a mini or ongoing series a strong writer/artist team will be required. After his great success last year relaunching Moon Knight I would love Warren Ellis to return to writing Captain Britain, team him with the visual brilliance of Alan Davis and any new Cap comic would surely fly off the stands. Captain Britain’s new title imagined by Ben Wilsonham. With Marvel planning a massive cinematic assault in 2015 and beyond surely they could find room for Captain Britain somewhere? OK I admit currently Cap might not have enough punch to carry his own film, but a cameo in Avengers 2 would stir the public interest and help publicise the first resolution. I can picture how the cameo might work, as a global threat envelops the Earth the Avengers notice London is under attack. However they don’t panic, as they announce to the audience the UK has its own Avenger, cue Captain Britain. If Cap debuts as a result of resolution one or two then Marvel must decide if he needs a fancy new set of super hero threads to do it in. Now don’t get me wrong I’m a big fan of Cap’s current look, but a cool new suit emblazoned on comic book covers and movie posters wouldn’t do any harm. Marvel could even hold a competition to see who can come up with the best redesign or trawl the wealth of Cap art and designs on deviantART – as long as they credit the original artist! However Cap appears in 2015 Marvel need to be aware that any attempt to reintroduce the blundering Cap that sometimes graced Excalibur is not wanted. Fans know Captain Britain is a physics genius, and any new writer needs to understand this and be intelligent enough to exploit it story wise, hence the choice for resolution one of Warren Ellis for this role. Whether Cap reappears in a team book or a solo title he is going to need a solid supporting cast to fight the good fight with. Marvel’s first Cap team-mate should be none other than his wife Meggan, and please note NightCrawler is not required to appear unless it’s to apologise for his lechery over Cap’s good lady wife during his Excalibur tenure. It might be intriguing to see Cap’s cast grow by his attempting to rehabilitate his mad brother Jamie, catch up with Inspector Thomas or crossing swords with any of his old Seventies foes. So here’s hoping Marvel are paying attention and follow these five simple resolutions in 2015 to make it the year Captain Britain is embraced by fans old and new. Agree, disagree or have any Captain Britain resolutions of your own? Then why not leave me a note in the comments below.